The Touch of Roy and Dale is the story of Roy Rogers and Dale Evans. Tricia Spencer recalls the impact and influence of Roy and Dale as only their fans and family could tell it. Included in this wonderful book are never before seen photos, art, poetry and songs, along with letters of fan mail, and a wealth of information about this awesome couple. There is so much more in this book that you just need to check it out for yourself! 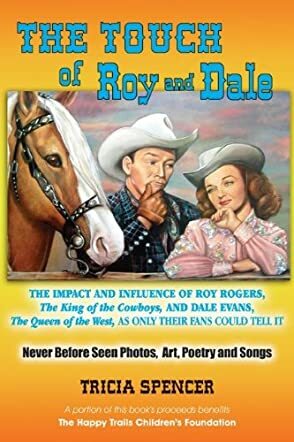 One sentence I read in this book says that Roy Rogers and Dale Evans touched lives, and their legacy lives on, and this is so true for those of us who remember them. I wanted to read The Touch of Roy and Dale to remember those early years of my life and the excitement as my parents talked about them, and always listened and watched as they were on television and radio. They were a household name that I will never forget. This book is so very interesting. Ms. Spencer goes into details about their lives, and the mountains of fan mail they received. And back in the day it was snail mail, not email, so you can imagine! I especially enjoyed hearing their children remembering their mom and dad, and the life they lived while growing up in their home. If you are fans of this Happy Trails couple, I really want to encourage you to pick up a copy of this book. There are just not enough words to tell you the wonders of this precious book!